Sami Inkinen founded and then exited Trulia about a year after Zillow snapped it up for $3.5 billion in 2014. He’s since moved on to build Virta, a health care startup claiming it can cure type 2 diabetes. It’s a bold claim. Most treatment plans offer to help those with the disease manage it, not get rid of it. But Inkinen, with zero medical background, believes he’s found a way to wholly eradicate diabetes for good. The secret is as simple as a low-carb diet. It seems pretty obvious — cut out the sugar and bad carbs and your diabetes will get better. But that’s easier said than done with humans. Inkinen tells me he’s learned through time where the pain points are and what people need to truly succeed. So far Virta has conducted a small trial involving 262 people and the results seem promising. A majority (91 percent) of those participating finished the program and 87 percent of them either reduced their dosage or went off their insulin, says the startup. Over half of the participants were able to reduce at least one of their diabetes medications. I sat down with Inkinen to talk about his company and why he decided to jump into the health care space after his success in the real estate field. 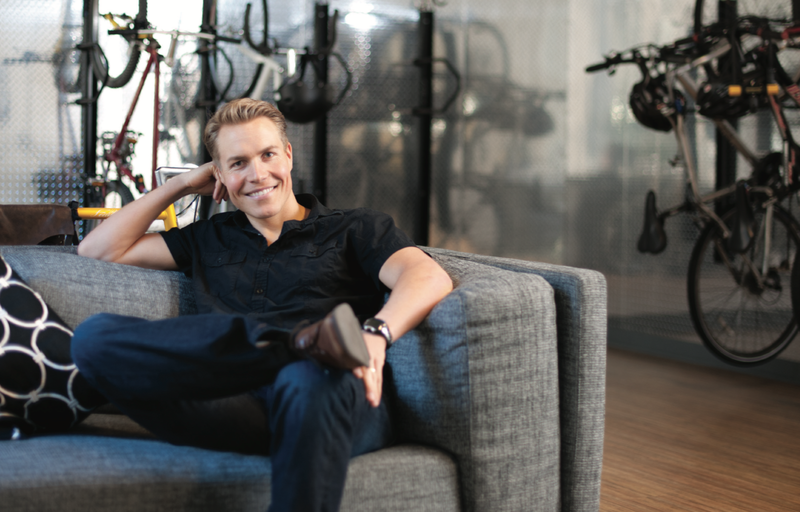 Founder Sami Inkinen relaxing in the Virta office space in downtown San Francisco. SB: That’s a bold claim that you’re making that you can cure diabetes. SI: Yeah totally…Without tech you can’t do Virta. We’re not just a software company, we’re a software company that combines biochemistry and science to cure the disease. If one of those is wrong it’s not going to work. SB: Do you worry you tell them a bit too early to get off their medications? SI: Yeah, that’s precisely the reason why we have our own doctors. That’s precisely the reason why we have a full-stack health care company…It’s absolutely critical that we get this data very, very rapidly so we can start adjusting them off of meds. If we don’t get people off the meds quickly and accurately, it’s actually dangerous for the patients. When you’re diabetic your blood sugar runs high. You take drugs, you get it down. If we can get your blood sugar down naturally and then you take drugs on top of that you’re going to be in the ER. SB: Okay, but this just sounds like a diet. SI: It sounds very simple. Like, oh carbs are bad throw the carbs out. Yes, but it gets more nuanced. How do you do it in a way that you can reverse the type 2 diabetes and do it in a way that’s very sustainable and you feel good about it? Because you know if you’re eating bagels and bread all the time and I say just stop doing that, you feel horrible and you don’t want to do that. It’s absolutely necessary to deliver results. The traditional approach is that it’s overweight or obesity that causes diabetes. Therefore all we have to do is help people lose weight. But, it’s a combination of tech and how we track the markers and the right science nutritionally. SB: Is that proprietary software that you’re using? SI: Yeah, we build everything in house… After the doctor makes all the clinical decisions about the patient, and so forth, what he’s looking at is basically a data pool of all the patients every day, several times a day. When he sees the data, he see’s that drug for that patient needs to go off. SI: Well it has the IP. The IP is in two places. One is the protocol that we use, which drives high participation and the results. It’s not trivial. It really has to be highly individualized. Whether it’s food or what you do or how you choose medications, it’s nothing one-size fits all. Every person is different. That’s the first one. The second one is this entire system where we collect data and data improves the protocols, this kind of cycle. The more data we have the better the protocol, the better the treatment, the more we can automate, the more efficient we can be. SB: How do you do that? SI: What we try to do is take thinking out of the picture for the patients. Every morning that you wake up you have a task to complete. Whether that’s tracking related, changing your nutrition, or some behavior change, or something else. We basically stitch together a personalized care plan for each patient based on what’s their background and what’s happening to them. You may have heard the Center for Disease Control, CDC, has a diabetes prevention program, which is really a weight loss program. It’s basically 16 educational modules over 16 weeks…It’s kind of like the diet approach, the cookie-cutter approach. You want to do the South Beach Diet, buy the South Beach Diet book and you get the 50 foods that we should eat and the 50 foods you shouldn’t. You can’t be successful in curing someone’s health if you have a one-size fits all approach. SB: You got involved because you were pre-diabetic. SI: I was on my way, yes. I was pre-diabetic. You may remember, I’ve got a company called Trulia, which just happens to be in this building. Once Trulia went public, I just stayed on the board and I stepped away from an operational role. I thought maybe I’ll start competing and I won the Ironman World Championships in my age group. (Inkinen has been a competitive triathlete since 2007). SI: I was like wow, this is freaking awesome. Then I found out that I was pre-diabetic. SB: Even after you were very active and athletic? SI: That was my moment of truth, if you will. I thought, it doesn’t make any sense. What we are telling people to do, the message to pre-diabetics today in America is “Don’t you worry. You’re getting fit but you have to eat a little less, eat a little healthier and exercise a little more everything will be just fine.” Well I had been doing that freaking 20 years. SI: That was the turning point for me. I started reading research and that’s what kind of led me to meet my scientific co-founders. The bottom line, what these guys had shown is that there is a way to nutritionally reverse type 2 diabetes without starving you to death. They had published all these papers. I was like this is nuts. This is 30 years-old science. I said the key that’s missing here is we don’t have the tech to deliver this, the continuous outpatient services. That was the catalyst for Virta. Then we kind of built the protocol, built the first product, and then the key step for me was I said we don’t want to be another Theranos. In health care, maybe we’re just shrinking our own pool, but we have to run a clinical trial. If this works, this is going to be absolutely huge. SB: If an employer wants to get involved with your program, do they just contact you? SI: Call us up, through our website, and also of course we have our sales as well…Our business model is, if we don’t reverse diabetes we don’t want to be paid. SB: When you’re saying that you cure it, do you mean that if they switch back to the same old diet they wouldn’t have diabetes? SI: Well type two diabetes is not an acute, like broken bones and then the bone is fixed and then it’s not broken anymore. Type 2 diabetes can be reproduced in any one patient. Of course, the subtle lifestyle changes have to last and that’s why you want to show that once you cure the disease it actually stays in remission. SB: What’s the individual cost? SI: It’s about $400 a month. Then low-income people we have patients that use a program that keeps them with access. SI: Yeah so that’s the average cost of diabetic medicine in America. SB: Do they have to stay on the program for life? $400 a month for life? SI: It’s one year minimum and then the second year is up to your choice. Whether you need our support or not. Then the second thing that we’re focused on is just scaling with employers, insurance companies, and patients directly. Letting them know that this works.